Least common multiple (LCM): The LCM of two or more given numbers is the least number which exactly divisible by each of them. Thus, 15 is a common multiple of 3 and 5. 30 is a common multiple of 3 and 5. 45 is a common multiple of 3 and 5. But 15 is the least common multiple (LCM) of 3 and 5. Rule: Resolve the given numbers into their prime factors and then find the product of the highest power of all the factors that occur in the given numbers. The product will be the LCM. 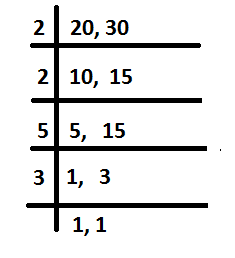 Example: Find the LCM of 8, 12, 15 and 21. Here, the prime factors that occur in the given numbers are 2, 3, 5 and 7 and their highest powers are respectively 22, 3, 5 and 7. Rule : Fist make (if necessary) the same number of decimal places in all the given numbers; then find their LCM as if they were integers, and mark in the result as many decimal places as there are in each of the numbers. Example: Find the LCM of 0.6, 0.9 and 0.36. Solution: The given numbers are equivalent to 0.60, 9.60 and 0.36. 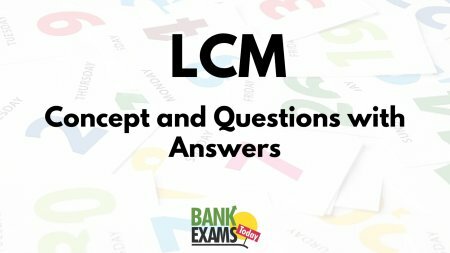 Now, find the LCM of 60, 960 and 36.Which is equal to 2880. Therefore, the required LCM = 28.80. Which is the least number which, when divided by 52, leaves 33 as a remainder, and when divided by 78 leaves 59, and when divided by 117 leaves as 98 as the respective remainders? We see that the remainder in each case is less than the divisor by 19. Hence, if 19 is added to the required number, it becomes exactly divisible by 52, 78, and 117. Therefore, the required number is 19 less than the LCM of 52, 78, and 117. Find the greatest number of six digits which, on being divided by 6, 7, 8, 9 and 10, leaves 4, 5, 6, 7 and 8 remainders respectively. Dividing 999999 by 2520, we get 2079 as remainder. Hence the 6-digit number divisible by 2520 is (999999 – 2079), or 997920. What least number must be subtracted from 1936 so that the remainder when divided by 9, 10, and 15 will leave in each case the same remainder 7? What greatest number can be subtracted from 10,000 so that the remainder may be divisible by 32, 36, 48 and 54?